NEW YORK—Criminal justice reform was the centerpiece of governor Andrew Cuomo’s inauguration speech when he was sworn in for his second term two weeks ago. On Dr. Martin Luther King Jr. Day Monday, the governor promised to deliver on his word, stating that he will end the state’s practice of trying 16 and 17 year-old criminal offenders as adults. New York and North Carolina are the only states in the country that try teenagers under 18 as adults in court. Depending on the judge’s decision, they may be placed in state prison. At an annual policy forum held in honor of Dr. Martin Luther King Jr. and hosted by the Rev. Al Sharpton’s civil rights organization, the National Action Network, Cuomo spoke via phone to lay out his political agenda for bettering the lives of minority New Yorkers. 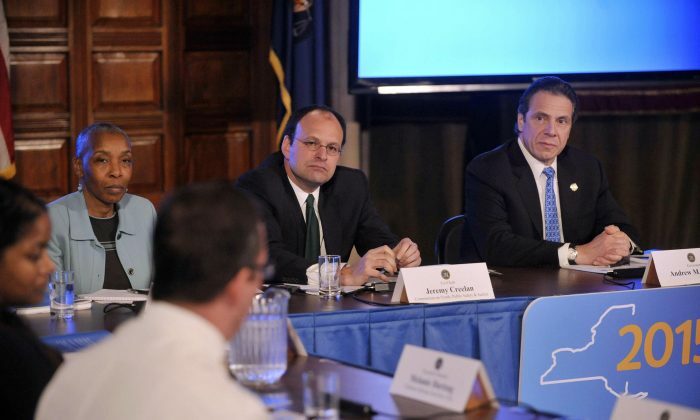 Cuomo’s Commission on Youth, Public Safety, and Justice, which he assembled in April last year, released a report on Monday detailing its recommendations on how the state can raise the age of criminal responsibility to 18. Among its suggestions was to create juvenile facilities where young offenders receive vocational training and mental health treatment, instead of placing them in prison. Advocates have long voiced concerns that adolescents who are still developing their brains and behave differently from adults suffer when they are incarcerated in adult prison facilities. “You put 16 and 17 year-olds in state prison, there is no way they’re not going to come out worse than they went in, which is the exact opposite of what we’re trying to accomplish,” said Cuomo via a phone recording. The report notes that by hiring staff trained in adolescent behavior and implementing programs catered to their rehabilitation, the teenage offenders are less likely to re-commit crimes.